Stratasys, yesterday, announced its entry into the Stereolithography segment with the launch of its new V650™ Flex Stereolithography 3D printer. The company aims to disrupt the existing market with its superior product offering which combine the power of large-scale printing across a wide range of resins. The new printer will exhibit better quality, greater accuracy, and lower costs in 3D printed prototype and part development. Above: The Stratasys V650™ Flex Stereolithography 3D printer/Image Credit: Stratasys Inc. The V650™ Flex Stereolithography 3D printer is Stratasys’ entry into the Stereolithography segment. It is the result of more than four years of testing. The printer boasts of a 20”W x 20”D x 23”H build volume. It has interchangeable resin vats. The V650 Flex printer has been tested with a runtime of over 75,000 hours and more than 150,000 parts produced inside Stratasys Direct Manufacturing, the service business of Stratasys. The V650 Flex puts the power of verified resins and a configurable system to work – helping customers produce extremely durable, highly complex and accurate parts. It is supported by a partnership with Royal DSM, a global purpose-led, science-based company in Nutrition, Health and Sustainable Living. The global customers will now have the freedom and choice to leverage the quality and high-performance of Somos® Stereolithography resins with the V650 Flex Stereolithography 3D printer. Customers will now be able to produce high-quality, durable parts that meet requirements of a wide range of applications with the Stratasys & DSM Somos-verified resins. Above: User-Friendly, touch-screen interface of V650 Flex Stereolithography 3D printer/Image Credit: Stratasys Inc. 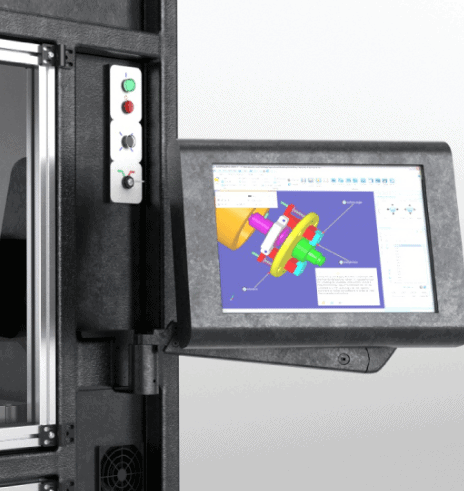 The Stratasys V650 Flex Stereolithography 3D printer comes with a user-friendly, touch-screen interface developed in parallel with SolidView build preparation software. Somos® Element:The antimony-free Stereolithography resin, specifically designed for producing strong, stable investment casting patterns with fine-feature detail and very low residual burnout ash. Somos® NeXt:The resin that provides the accuracy of Stereolithography with the look, feel and performance of a thermoplastic. Somos® PerFORM:The material-of-choice for applications that require strong, stiff, high-temperature resistant parts, such as tooling and wind tunnel testing. Somos® Watershed XC 11122:A clear solution for designers looking for ABS and PBT-like properties for Stereolithography – producing highly detailed, dimensionally stable, optically-clear parts with water resistance. Stratasys V650™ Flex Stereolithography 3D printer will be exclusively unveiled at the upcoming Additive Manufacturing User Group (AMUG) Conference 2019 in Chicago.